You may have run right by it dozens of times in a rush to get those all-important Soarin’ Fast Passes or en route to World Showcase for something more exotic. 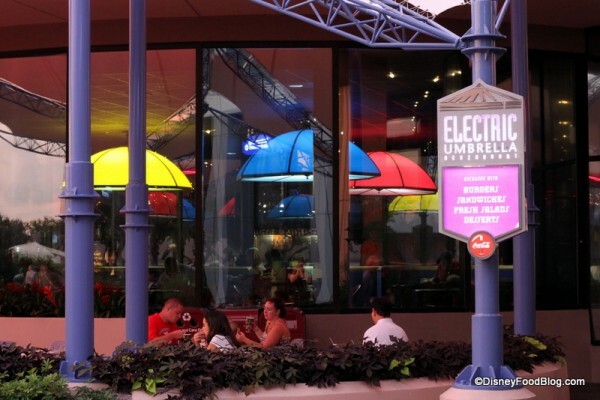 But if you’re starving (or have picky, non-experimental eaters to feed), that neon sign over the Electric Umbrella in Epcot can be a very welcome sight. 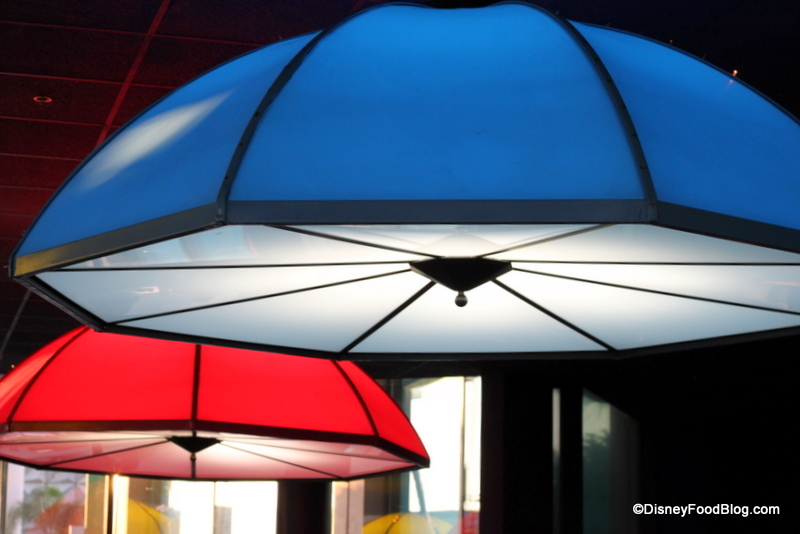 Located adjacent to both the Innoventions Fountains and Mouse Gear, you can’t miss this restaurant. It anchors the plaza in Epcot’s Future World to the left, as you peer toward World Showcase. There is a ton of shaded seating here, so finding a table and a place to take a break is rarely a problem. 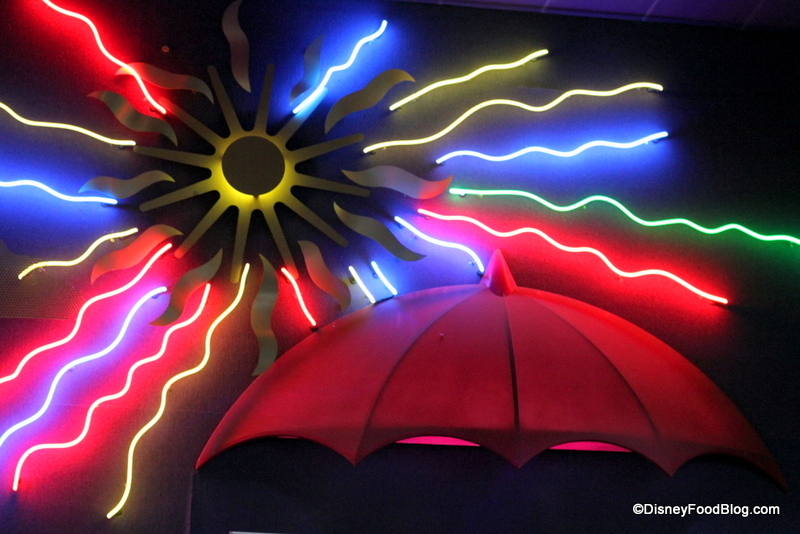 And inside, you’ll find a fun, futuristic, neon-weather vibe. This is early Epcot at its best, IMHO. Now, should you seek seating that’s a bit quieter than that outside or underneath the giant umbrellas, here’s a feature that many people don’t even know about: there’s an upstairs area in the Electric Umbrella, too! Head up here to find quieter quarters and smaller crowds. The ordering area here is pretty standard. There are no computerized kiosks, and cashiers still take your order in the “old-fashioned” way. After that, you proceed up to the counter for food pick-up. I had heard that there were a few “more interesting” choices on the menu here than I remembered, so we were definitely anxious to check it out. While you’ll find a couple of burgers anchoring the menu, they’re a little something different from your standard options. 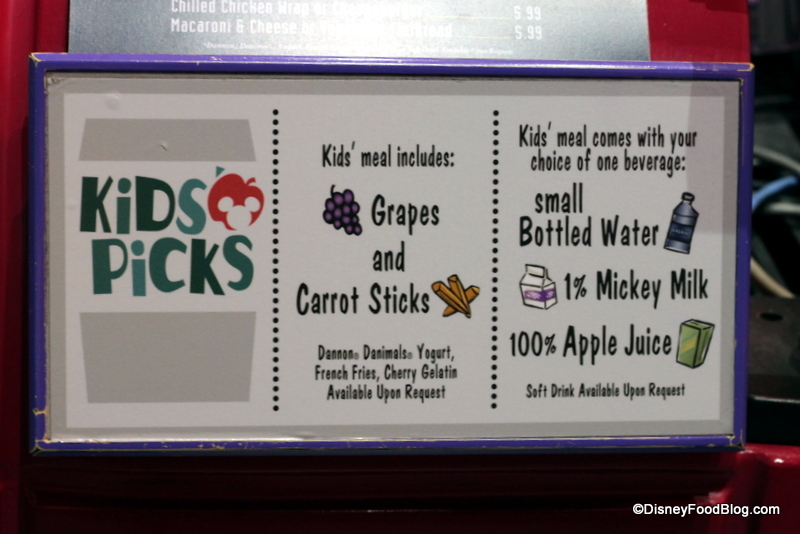 Slightly less generic Kids’ Pick offerings include a Chicken Wrap and a Vegetable Flatbread. We’ve also heard pretty good things about the Meatball Sub. 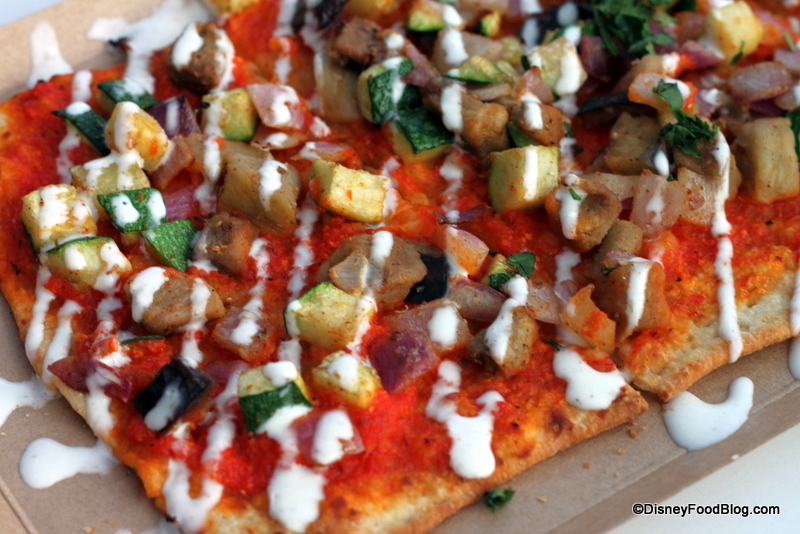 On the second menu, the adult’s Vegetable Flatbread was a unique offering that caught my eye. 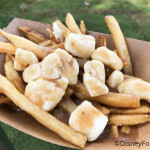 After several days of snacking my way around the World at the Epcot Food and Wine Festival, this lighter option held some definite appeal. In an effort to keep us grown-ups healthy, too, the adult entrees here offer the option of grapes instead of french fries as a side item for some of the menu items. 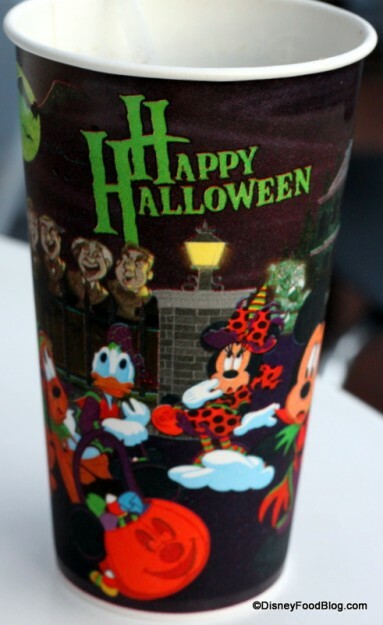 Since we were visiting during the run-up to Halloween, our beverage came in this fun Halloween cup. Soft Drinks are self-serve here, so feel free to get that refill! 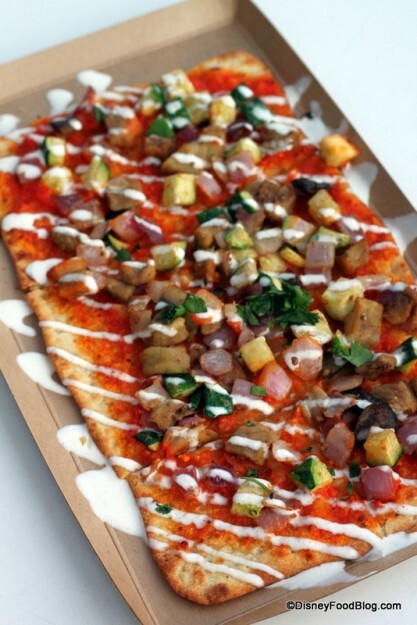 Since it had already piqued my interest, I decided to try the Vegetable Flatbread. In lieu of tomato, the sauce here is made with roasted red peppers, which gave it a bit of a kick! Topped with diced and sauteed red onion, zucchini, and eggplant, this was really colorful! And although the yogurt dressing was a nice garnish, I could have done with a little cheese — and without the sprinkle of cilantro. While a little bare, it’s still a nicely-sized, flavorful, and not-too-filling vegetarian option. It’s perfect for those really hot Orlando days! At the polar opposite of my veggie flatbread was the enormous Mushroom and Swiss Cheeseburger. This one is another foray into the Disney gourmet burger scene. Notice the distinct lack of grapes here. There is a WHOLE lot goin’ on here. 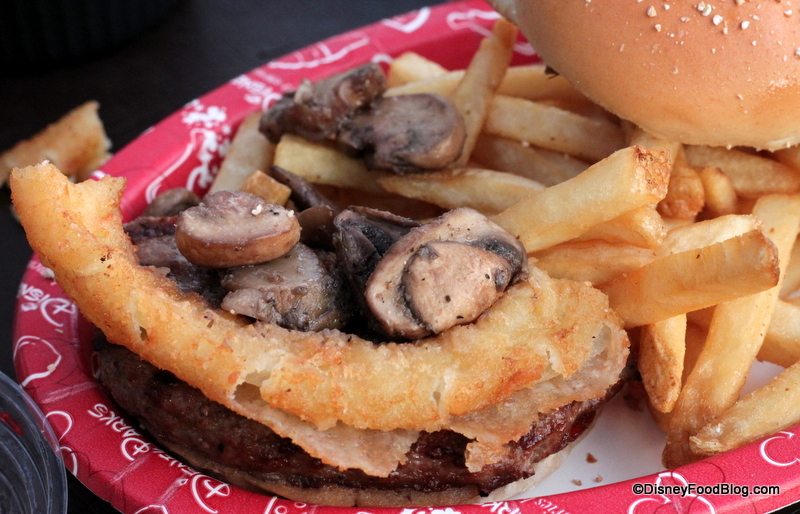 1/3-pound Angus beef patty is layered with Swiss cheese, bacon, sauteed mushrooms, and a huge-ish fried onion ring. And I have to say — it was pretty delicious. While the meat was a little more cooked than I would have liked, that’s to be expected in a counter service spot. But the toppings were all delicious and generous. And while $10+ may seem a little steep, you’re getting a lot for your dough and this could easily be shared. We wanted a little something sweet as well, and I figured it was time for me to start ordering those little, prepackaged desserts. 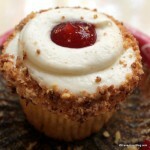 I never, ever get them, but I’d heard good things about the Strawberry Cheesecake and wanted to check it out. We weren’t caught off-guard by the fact that this isn’t really what you think of as cheesecake, since normally, cheesecake comes in a slice, not a cup. And this is the same bowl o’ cheesecake that can be found at other spots around the resort. 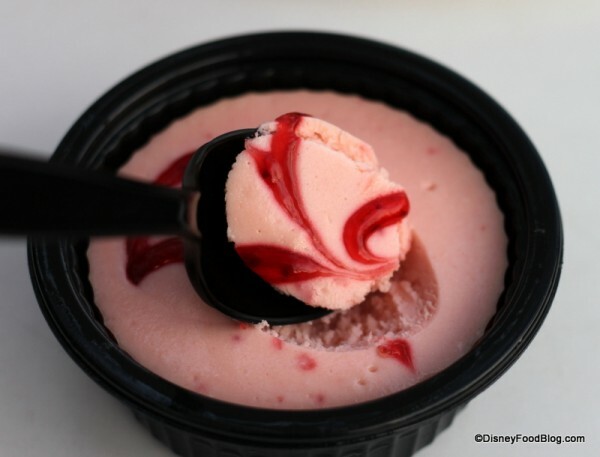 But digging in, I found that it had a creamy consistency and just the right amount of strawberry flavor. 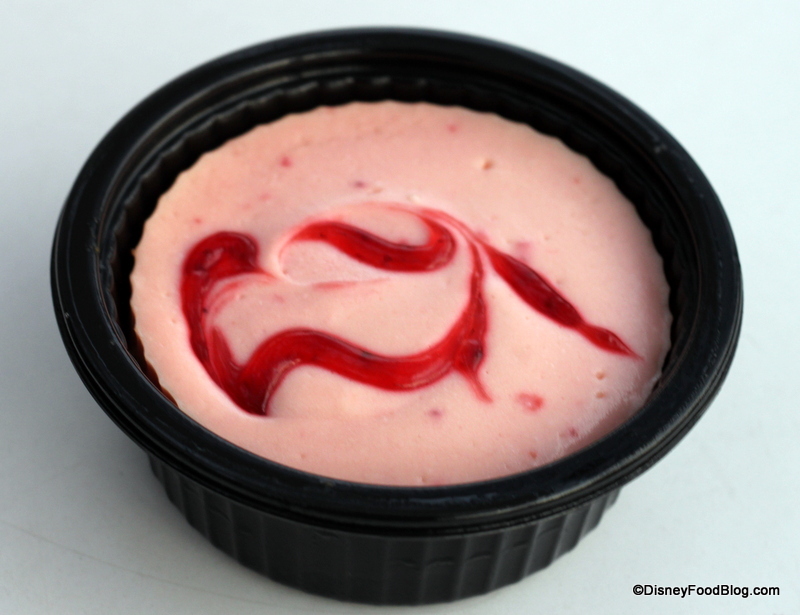 That little swirl of strawberry gel added a little extra fruit sweetness and color, and was a nice touch. The graham cracker crust wasn’t crisp, but definitely offered a nice texture and flavor to the dish. And here’s a fun new-to-me find! For those of you who have been eating french fries with strawberry milkshakes all your lives, I wish you’d let the rest of us in on the secret! When I took a bite of strawberry cheesecake and then a bite of french fry — I was blown away!!! Sounds gross, I know…but it was awesome! That said, if cheesecake and french fries aren’t your thing, just head across the way to Fountainview Ice Cream for a handmade ice cream cookie sandwich! OK, guys, I’ll be honest with you. I had been avoiding Electric Umbrella. There are so many other delicious restaurants in Epcot…why would I waste time with this one? Well, I’ll say it. I was wrong. I actually really, REALLY enjoyed my meal here, and the opportunity to just sit and people watch from seating both indoors and outdoors was much appreciated after a long day in Epcot. Do you have a favorite selection at Electric Umbrella? Let us know! This is one of my little secrets. They used to do a double bacon cheeseburger that was slightly different than the other counter service burgers, and it was heaven. Absolute heaven. We made sure we made our one burger meal of the holiday here. Last time I had the meatball sub and it was still so good. We love the people watching here sat by the window downstairs. Fab and underrated. 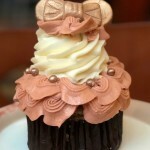 A bite of one, and then the other – delish! 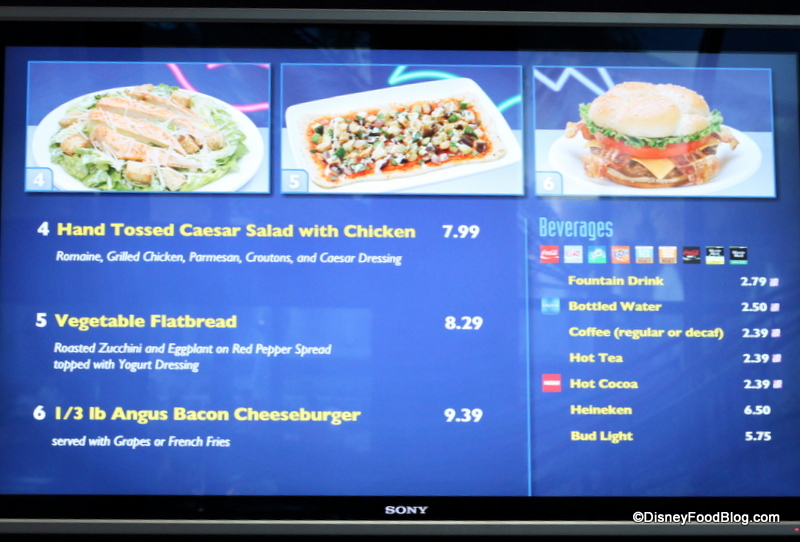 Will they keep some of these menu options when it turns into a Starbucks, or will it all become pastries and sandwiches? Is it just the fuzzy photo, or do the 8 piece nuggets look different on the kid’s menu than the regular one? Same price, so I’m assuming the same nuggets, right? Also, do you know if you can ask for no cheese on the kid’s cheeseburger or is it some kind of prepackaged burger with the cheese already attached? If we can get the burger sans cheese, this might work for a lunch option for my family. Yay! I love your counter-service reviews as much as the table service ones! We’re planning our very first trip to Disney, so everything park wise is new and mindbloggling to us. As AJ said at the beginning of the post – this place is good for those who are picky eaters or have kids that are picky. I would rather bring picky eater kids here to eat something than order something expensive and “exotic” in World Showcase and leave it on the plate. There is a place for this type of restaurant and it certainly is more attractive than a McWhatever. Nicola — Glad you enjoy it! Pudge — Ba ha ha! Poor EU!! Raxl8 — Yes! I always get peanut m&ms + popcorn at the movies! 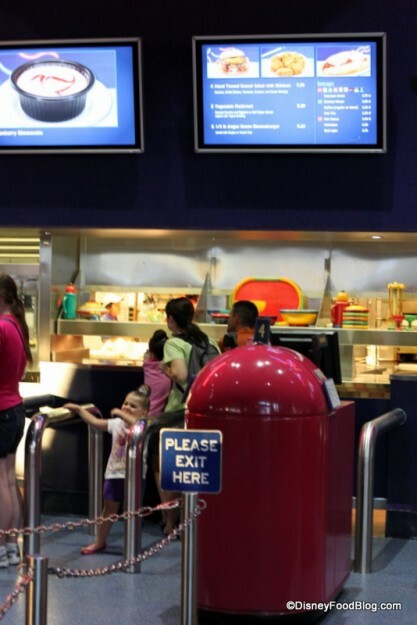 🙂 Did you see that at AMC Theaters in Downtown Disney they have popcorn mix-ins like milkduds as part of the menu items? Jamie — This location will not be a Starbucks. The Fountain View Cafe across the “way” from Electric Umbrella will be refurbished and will serve Starbucks in 2013. They will offer a mix of Starbucks items and Disney items there. 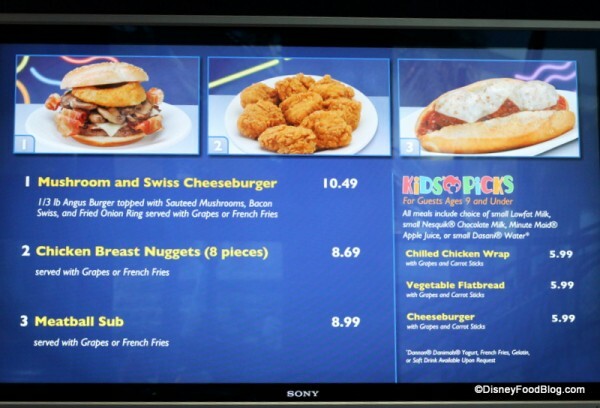 Raelynn — The first menu listed is still the adult menu, they just have two different nuggets pictures going on on the two different menu photos. There aren’t any nuggets on the kids’ menu, so all nuggets you’re seeing are adult sized orders. 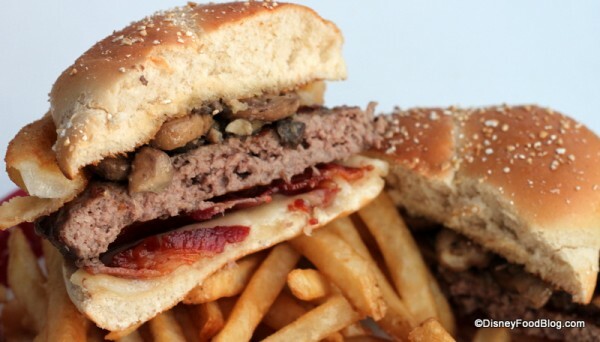 You can very likely ask for no cheese on the kids’ burger. Disney’s usually pretty good with special requests and special diets, so I doubt they would have the cheese fused to the burger pre-cooking. Great question! Agnes — Wonderful!! Let me know if you have any questions. Thanks for reading! Alan — Ha ha! 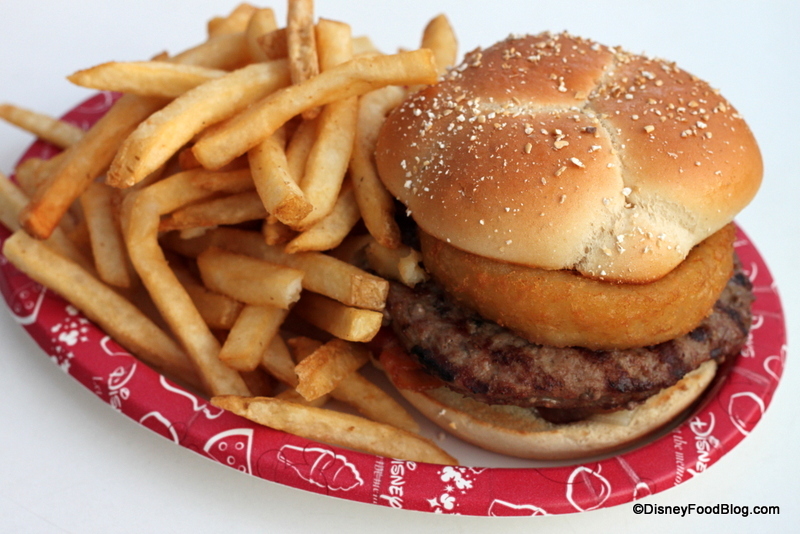 McWhatever…yum! 😉 Agreed, Alan; sometimes you need a standard counter service location, and this is it. Though I will admit I was impressed and surprised at how much I enjoyed it! 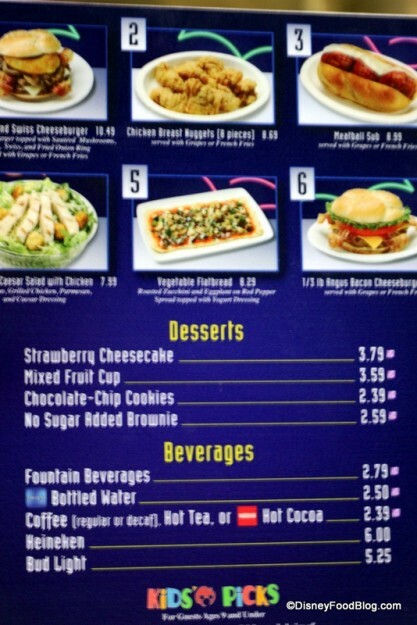 I have to say that I’m kinda sad that they got rid of the Black Bean flatbread or whatever it was called. It was a nice, relatively filling, vegan-izeable option. Whomp. Ditto on the blackbean flatbread. It had a corn salsa and chipotle mayo that I loved. Even as someone who isn’t a vegetarian, it was one of my favorite counter service items anywhere. Wonder if it’s available somewhere else? 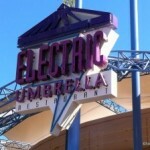 Oh, and refills on the drinks is a big reason our family loves the Electric Umbrella! Electric Umbrella is good for the air conditioning and the refill-your-own unlimited soft drinks. Otherwise not the greatest choice in a park with so many options. One of my favorite Disney memories was spending an hour sitting on the EU’s patio waiting for the Fointain to start. Usually it’s every 20 minutes, but is skipped two shows for some reason. Not that we cared. Good friend, good nuggets, and a hot chocolate on a cool December night in Epcot. What more can you ask for? Sometimes it’s not the quality of the food, it’s who you share it with. 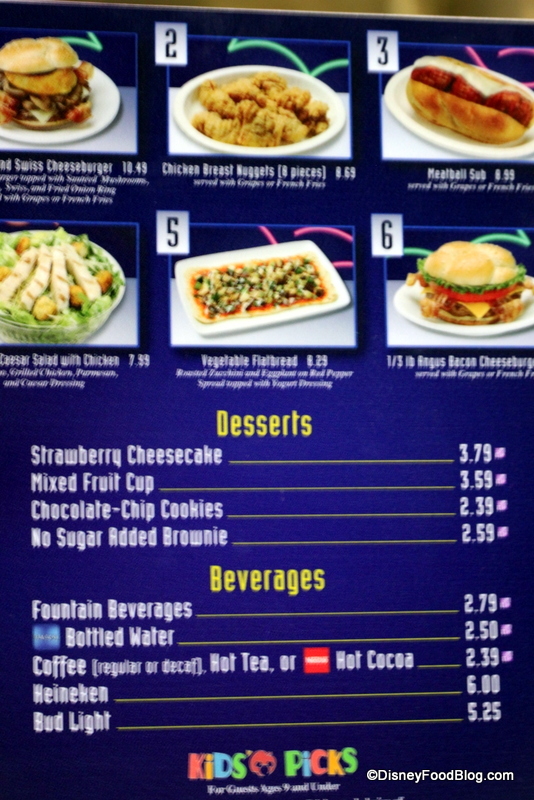 I’m SO gutted they have removed the southwest black bean burger from the menu. Its so difficult to get decent veggie food (and by that I mean anything BUT a cheese pizza or veggie burger) from a counter service restaurant in WDW, so I was so pleased when I discovered the southwest bean burger on the menu as it was so tasty and different from others available. We veggies never get any choice at all when dining at a counter service restaurant, as like the menu above there is only ever ONE veggie option. Unfortunately I don’t like Aubergine (eggplant) so the veggie flatbread’s off the menu too, so I guess this is another restaurant off the menu – SHAME, I really enjoyed it here last holiday. Maybe they can make it sans eggplant for you. 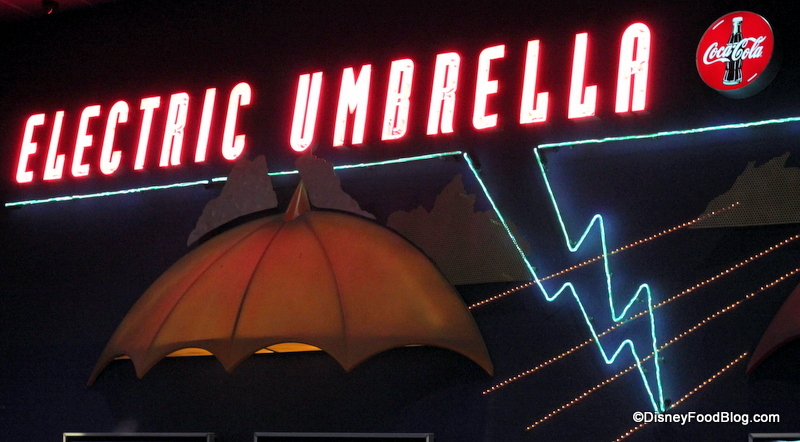 Ok, so I’m 6 months late commenting on this post, but wanted to throw in my 2 cents on Electric Umbrella since we were just there today! 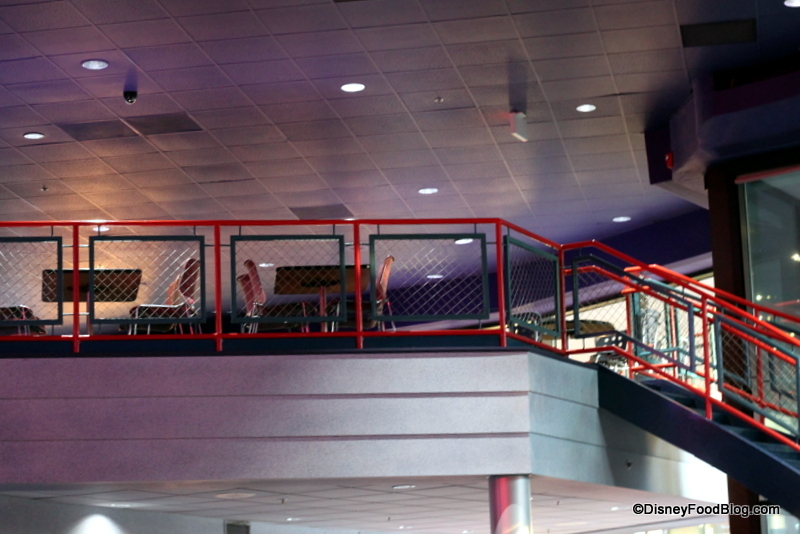 I generally like these counter places, this one & Cosmic Ray’s at MK in particular. Quick, cheap (for Disney) & satisfying. 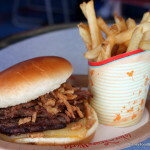 Love the veggie burger at Cosmic Ray’s! Tried this veg flatbread today and OH, how I hated it! With the fire of a thousand suns I hated it! Maybe the red pepper sauce was too much for me (although I don’t usually mind a little kick, but possibly too much kick?). But there was something else, some other flavor I couldn’t quite place, that just did not work for me at all. Something with the yogurt sauce? Tasted kind of like nutmeg, I think. Whatever it was, mixed with the spicy red pepper sauce, just…yuck! And unfortunately, there’s no other veggie option on the menu. I ended up eating my kid’s fries. We’ll keep coming here, we love the free drink refills! Next time I might get the burger and just hand the patty over to my hub so he can have a double. Come to think of it, he’d probably be all for it! Just stumbled upon your blog looking for flatbread pizza recipes and thought I would give you an update on the Vegetarian Flatbread at Electric Umbrella as it is now different than what you described. It now has a base of tomato pesto, then mushrooms and feta and topped with a healthy amount of fresh arugula. I am not usually a fan of arugula but I absolutely loved this. I really enjoyed our meal at the EU.